Good morning and welcome to my crafty blog! todays post is my DT project for the new challenge that started the 26th April over at Stamp-n-Doodle . Ribbons and bows is the theme and there are some fine examples from the DT using Stamp-n-Doodle digital images embellished with, of course, Ribbons and Bows. Stamp-n-Doodle are offering a digi image of the winner's choice plus a badge for the 1st place winner. The winners of the Top 3 spots get a Stamp-n-Doodle badge to display on their blog. I chose the digi image of a young girl with her Cell/ Mobile Phone/ Handy (depending on where you live, pick one) waiting for a call. I've printed the digi image with a lilac frame from Word and I've used my Tombow waterbased markers to colour the digi image.The image was matted on Purple, Pink and Lilac cardstock and some faux lines pencilled in with a purple maker. 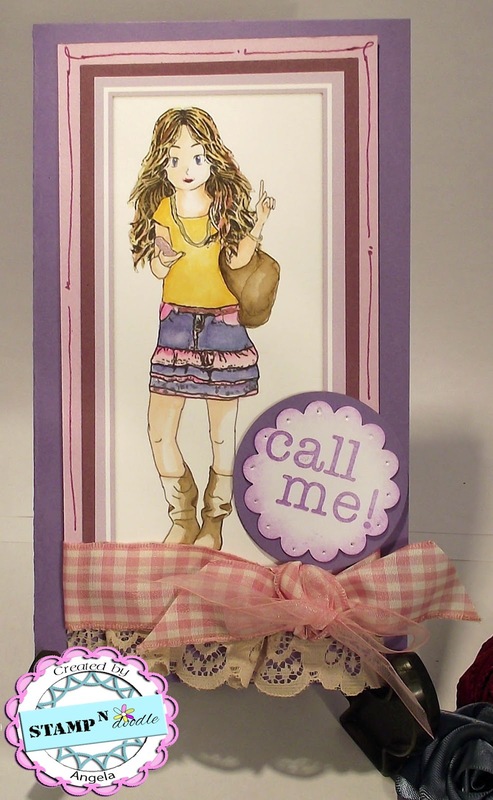 I added some lace and pink gingham ribbon 'with a bow' to anchor the image to the based of the card and addedthe stamped sentimemt " Call Me!" from Stamps of Life . I used a gold metallic pen to highlight the necklace and bracelet to abring a bit of subtle bling to the finished card. Thanks for stopping by and reading my blog. Your time and comments are appreciated. Love Paints - Crafty Bloggers Network Challenge. Easter Wishes - The Crafty Pad - #164 Eggtastic!